A POP server receives and stores your email until you download it to your computer using an email program. Once removed from the POP server email cannot be retrieved again. Some email clients include the option to leave a copy on the POP server for a specific number of days. We also provide our customers the ability to read email using a web browser. In this case the email stays on the POP server and is managed with the browser. A SMTP server forwards your email through the Internet. When you set up your email client to send email, it sends it to a SMTP server which in turn routes your email to its destination. The ISP providing you with Internet access normally provides your SMTP server. However, we provide SMTP services to customers who must use another ISP when travelling. This avoids the inconvenience of changing SMTP servers when away from the office. Each domain with email addresses must have a MX record. The MX record tells the Internet where your email is hosted. Make sure your outgoing (SMTP) configuration is set to “Login with username” or “Use Authentication”. While the standard outbound port (25) will work, your outbound mail will be checked for potential Spam and flaged as such if it contains certain keywords or images. To avoid this, change your outbound port to the “Alternate” or “Submission” Port, 587. 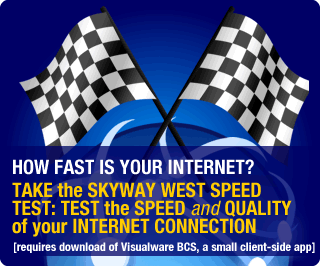 You may use nearly any combination of Security settings and ports that work for you, however since the network between you and our Mail Server is secured by Skyway West we suggest leaving SSL/TLS off for best performance. 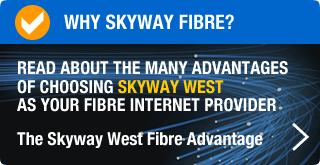 You must use a Secure connection if you connect from outside Skyway’s network. We recommend you turn on SSL for both incoming (POP) and outgoing (SMTP) email. If your mail client does not support SSL and you want to connect from outside our network you must use Secure Webmail. Ports 110 and 143 are blocked from outside Skyway Networks; please use the SECURE ports instead.